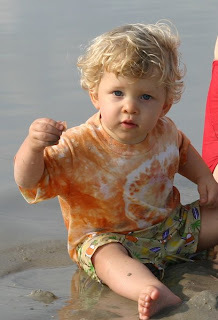 Finn's love-hate relationship with sand, and the beach in general, began on our first trip out to the water. He didn't like the sun in his eyes, the sand that stuck to his skin, or the waves that threatened to knock him down even at knee height. He moderately enjoyed riding on daddy's shoulders or mommy dipping his legs after a wave went by, but that was the extent of his beach participation for the first couple of days. 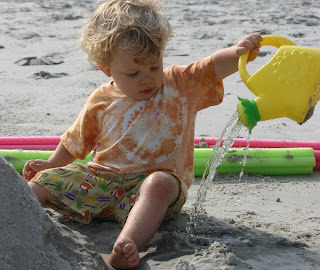 Eventually, his big sister showed him how to dig in the sand and pour water from the watering can on his sand mounds. He discovered the waves weren't so scary when you just sit on the very edge of the water line, and waving at every person that walks by brings lots of smiles. By the week's end, I think Finn actually did enjoy the beach a tad.